Strawberry compote is beyond easy to make: a few bright spring berries, a bit of sugar, and a splash of water or juice, plus about 10 minutes of cooking time gets you to one deliciously sweet and tangy bread topper. 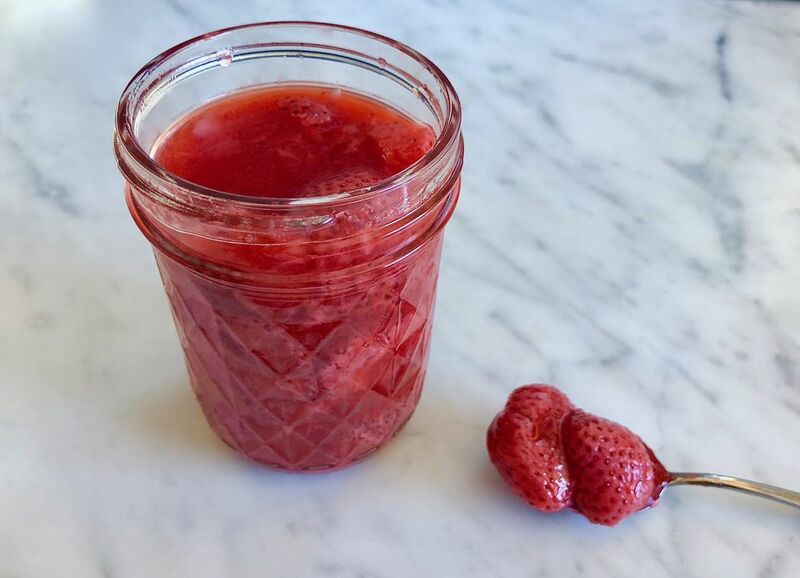 Use strawberry compote much as you might use jam—spread on toast or added to sandwiches. Additionally, compote is wonderful spooned onto yogurt or ice cream, served alongside slices of cake, or cast to play the role of something fruity and sweet on a well-balanced cheese or charcuterie platter. Of course, you may choose to enjoy it simply by the spoonful right out of the jar. Rinse the strawberries, pat them dry, and then hull the fruit: insert a knife in at an angle under the leaf cap, twist to cut out the leaves and white core underneath. Discard and repeat with all the berries. Cut larger berries in half or quarters; leave smaller berries whole. Put the berries in a saucepan. Add the sugar and juice or water. Bring to a boil, reduce the heat to low and simmer until the strawberries are all soft and just starting to fall apart and the liquid thickens, between 5 to 10 minutes. Taste, and add more sugar if you like. Let the compote cool. Transfer to a clean pint jar and store, covered and chilled, for up to 2 weeks. Red wine or a berry liqueur adds an adult kick to the compote (the boiling will cook off the alcohol, but the flavor will still be there). Balsamic vinegar adds a sophisticated edge and imparts a sweet-tart flavor. Lemon juice will tone down the sweetness of the compote. Up the citrus with 1/2 teaspoon orange or lemon zest. Add a savory component with 1/2 teaspoon freshly grated ginger. Spice things up with a minced small fresh chile. Use a mix of berries—raspberries are a particularly good choice and will keep the red hue bright, but any other fruits will work, although blueberries and blackberries may muddy the color.